A yellow and blue rowing boat pulled up on to the shore of an island in the middle of a lake. How does the owner get to it? Another boat perhaps? Narrowboats and houseboats moored just downstream from Newbury on the Kennet and Avon Canal. This section of the canal - or navigation (combined river and canal) began its construction in 1718 under the supervision of engineer John Hore of Newbury and in 1724 the section between Reading and Newbury was opened. The remainder of the length to Bristol was completed between 1794 and 1810. The canal fell into disuse due to the coming of the railway but was restored and fully reopened in 1990. An elegant footbridge over the River Kennet next to Greenham Lock near Newbury, Berkshire. The bridge forms the entrance to a boatyard and dry dock. This section of the canal - or navigation (combined river and canal) began its construction in 1718 under the supervision of engineer John Hore of Newbury and in 1724 the section between Reading and Newbury was opened The remainder of the Kennet and Avon to join Bristol and Reading was built between 1794 and 1810. It was fully reopened in 1990. A stretch of the River Kennet as it flows through Reading on its way to join the Thames. This area was important in medieval times, being the main transport link for the huge and powerful Reading Abbey, founded in 1121 by Henry I. 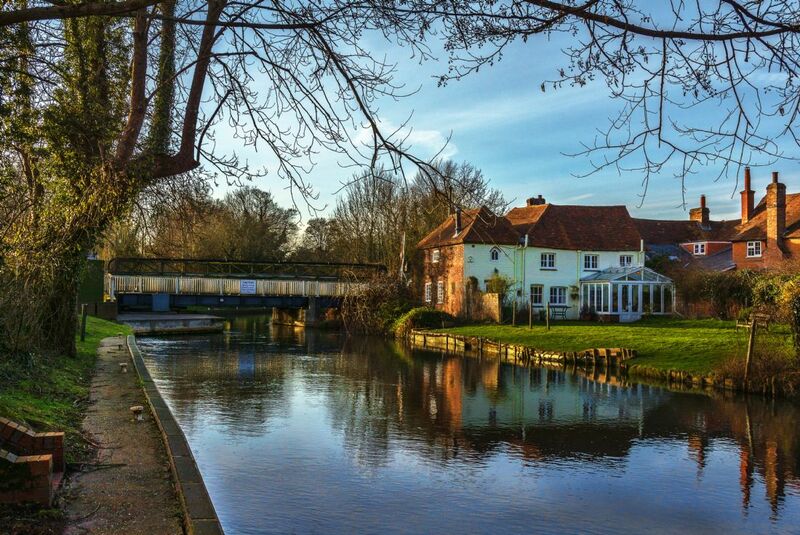 Later known as the Kennet Navigation, it was a stretch of navigable waterway between Reading and Newbury constructed between 1718-23. This became part of the Kennet and Avon Canal opened in 1810 to link Bristol and Reading - and on to London via the Thames. Snow has fallen on the meadow known as Oxley's Shaw in Tidmarsh, West Berkshire. The brook flowing under the wooden footbridge has frozen and snow covers the footpath l;eading over it. This path joins the villages of Tidmarsh and Sulham with the River Pang just beyond the line of trees in the background. It was in Tidmarsh Mill that Lytton Strachey and Dora Carrington lived for a while, so it became a centre for the Bloomsbuty Set. Standing at County Lock near the centre of Reading, Berkshire, looking across the Kennet to the old stable block, once belonging to Simonds Brewery which occupied this entire area. The Kennet Navigation here would have been busy with narrow boats and brewers' drays transporting barrels of beer to the local area and beyond. The Kennet Navigation and canal was constructed between 1794 and 1810 to link Bristol with the Thames and London, the brewery making full use of this highway. 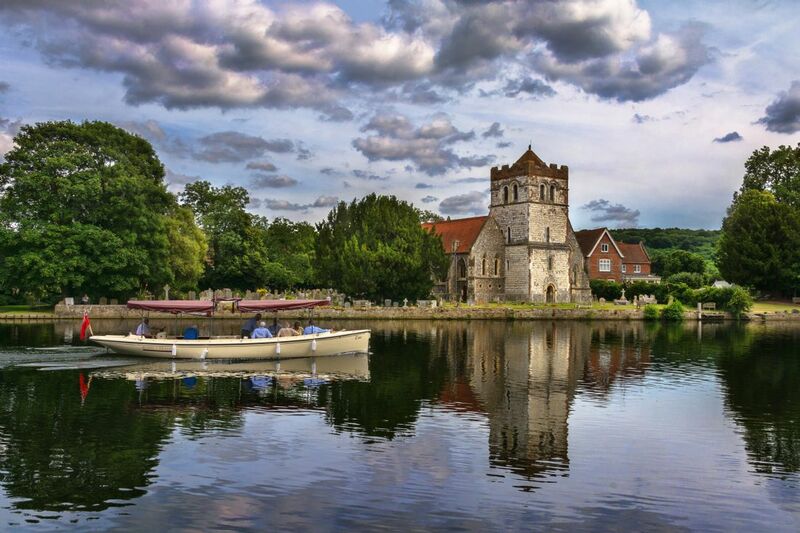 A pleasure boat taking its passengers along the River Thames passing the parish church at Bisham in Berkshire. The 12th century parish church of All Saints at Bisham stands on the banks of the Thames and is next door to Bisham Abbey, the national Sports Centre. Unsurprisingly, racing boat crews can often be seen training on the Thames here. The pleasure boat has probably come from the Buckinghamshire town of Marlow on Thames just downstream. A view from just below the bridge of the River Thames as it flows past Abingdon on its way to Reading and London. Here the spire of St Helen's church dominates the scene - a well known landmark to users of the Thames. It inspired the artist JMW Turner who featured ii in a painting called 'Abningdon'. This ancient town is now in Oxfordshire although until relatively recently it was in Berkshire and was at one time the county town. Here is a popular mooring place for Thames boaters. A view of Round Hill, one of the Wittenham Clumps - tree-crowned hills near Wallingford in Oxfordshire as seen from across the River Thames near Days Lock. The correct - ie not local - name for these is the Sinodun Hills, this being derived from an ancient Celtic word for 'fort'. A wooden bridge crossing the River Pang as it flows through Moor Copse nature reserve on the outskirts of Tidmarsh in Berkshire. The Pang flows from the Berkshire Downs to Pangbourne where it meets the Thames. This image was taken during a summer walk through the woodland and captures the play of light and shade as the sun beams through the trees. An Autumn scene on the Thames at Sandford Lock just south of Oxford. Taken late in the day during early November, the low sun intensifies the autumnal colours. Sandford lock is the deepest on the Thames and is also one of the oldest. Looking towards the Brecon Beacons from the dam at the northern end of the Talybont Reservoir in Powys, South Wales. In the foreground is the valve tower reflected in the almost still water. Built in the 1930s to provide water for Newport, this is the largest reservoir in the National Park covering an area of 318 acres (128.69 hectares). It now also generates electricity for the local community using water from the compensation flow. An abandoned corrugated iron farm storage shed near Sulham Woods in West Berkshire. This image was captured one afternoon in late January as the low sun was sending long shadows over the fields. In the background can be seen Sulham Woods, administered by the Forestry Commission and a Site of Special Scientific Interest (SSSI). Sulham is a small village nestling at the foot of Sulham Hill and lying by the banks of the Sul Brook which makes its way to the Thames near Pangbourne. 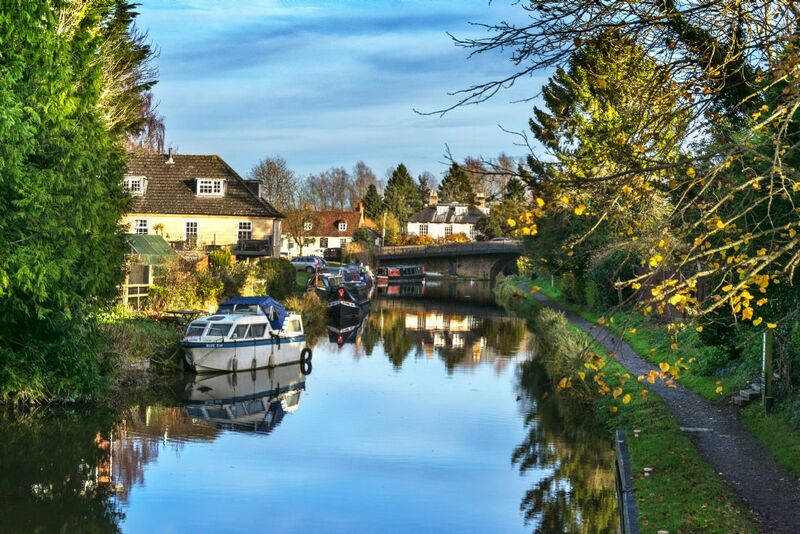 A stretch of the Kennet and Avon Canal as it passes close to the village of Theale in West Berkshire. Taken in late autumn, these houses are on the canal bank near Sheffield Lock and the swing bridge. The canal was constructed between 1794 and 1810 to join the Thames at Reading with Bristol, following the courses of the rivers Kennet and Avon. The Great Western Railway subsequently took most of the goods transportation and the canal gradually fell into disuse before being recently restored. The bridge over the River Wye at Chepstow, (Cas-gwent), which links Gloucestershire in England with Monmouthshire (Sir Fynwy) in Wales. The sun is setting at the end of a late September day and the lamps on the bridge are gradually lighting up. Chepstow was a vital stronghold from Norman times when William I saw its importance as a frontier town. In the background can be seen the towers of the castle, originally built by William FitzOsbern in 1087. The Nash Point lighthouse on the Monknash coast of the Vale of Glamorgan in South Wales. Two towers were built in 1831-2, a low one in the west and a higher one on the eastern end of the complex to warn shipping of the dangerous Nash Sands below. Both worked together until 1920 when the low tower was decommissioned, the eastern lighthouse then doing both tasks. It was manned until 1998 when it became automatic. Nash Point lighthouse on the Monknash coast of the Vale of Glamorgan in South Wales. Two towers were built in 1831-2, a low one in the west and a higher one on the eastern end of the complex to warn shipping of the dangerous Nash Sands below. Both worked together until 1920 when the low tower was decommissioned, the eastern lighthouse then doing both tasks. It was manned until 1998 when it became automatic. The Monmouthshire and Brecon Canal as it passes through the village of Talybont on Usk in Powis, South Wales. 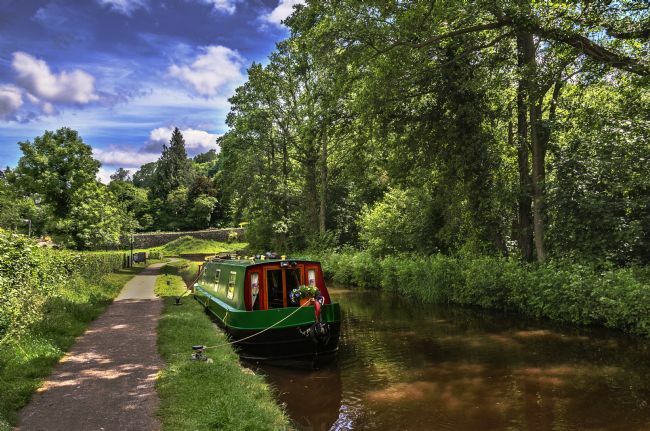 This isolated canal which meanders through the Brecon Beacons National Park was originally designed to carry coal and iron to Newport on the Welsh coast. At present the section from the canal basin at Brecon to Pontnewydd is the only navigable part but plans are in place to eventually extend this to Newport. A view from the gateway into Sulham Woods in West Berkshire looking over the village of Sulham and the Pang Valley. This was captured late on a January afternoon as the sun was dropping to the horizon. The Pang Valley follows the course of the River Pang which flows from near Bucklebury to the Thames at Pangbourne. The village of Sulham, at the bottom of the hill lies on the banks of the Sul Brook, a smaller tributary which also joins the Thames further downstream. 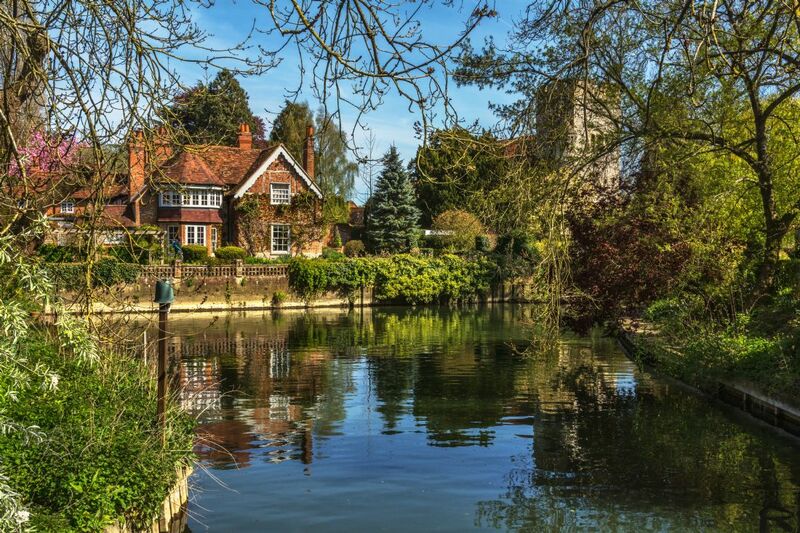 A quiet backwater at Goring on Thames, Oxfordshire. Here the water is calm having rushed through the mill and now makes its way back to the main river. On the far bank is the church of St Thomas of Canterbury. Goring is a small village on the north bank of the Thames and is joined to Streatley on the south bank by an attractive road bridge. Here the river runs through the Goring Gap between the Chiltern Hills and the North Wessex Downs. The house in the background belonged to George Michael. A view of the Palais du Luxembourg which is in the 6th arrondisement of Paris, It was built between 1615 and 1645 to be the residence of Marie de Medici, the mother of King Louis XIII. However, following the Revolution (1789-99) it was turned into a civic building. This view looks at the south side across the decorative pond on which model yachts are often sailed. This image was taken from one of the public footpaths in the Jardin du Luxembourg. The brook flowing through the fields separating the villages of Tidmarsh and Sulham in West Berkshire. The footpath leads walkers across the water by way of a wooden bridge. This is the view looking west towards Tidmarsh on a winter's day. A little further along the path is Tidmarsh Mill on the River Pang, once the home of Lytton Strachey and Dora Carrington. The meadow just across the bridge here is called Oxley's Shaw. A meadow, Oxley's Shaw, in the the village of Tidmarsh, West Berkshire after a fall of snow. This is close by the River Pang and Tidmarsh Mill, once the home of Lytton Strachey and Dora Carrington - part of the 'Bloomsbury Set'. The path here runs through the meadows connecting the villages of Tidmarsh and Sulham. A Thames sailing barge of the type once common around the Thames estuary and England's East Coast. Being flat bottomed with a shallow draft of only two and a half feet they could sail into the creeks and inlets around the Thames estuary to carry goods. The collapsible main mast allowed them to sail under bridges.They were also very stable and possessed cargo space above and below deck. Boats moored at the Morston Quay in Norfolk, on of the many inlets in the mudflats along this stretch of the North Norfolk coast. Boats moored at low tide on the River Deben at Woodbridge, Suffolk. Woodbridge is a pretty market town on the banks of the Deben, abouit 8 miles inland from the coast. It is at these lower stages of the river that it becomes tidal before entering the North Sea by Felixtowe. This area is ecologically important and is designated an Area of Outstanding Natural Beauty (AONB). It is also a Ramsar (special protection) site. The elegant Tide Mill at Woodbridge, Suffolk on the River Deben. This is the 'newest' of the mills that have stood on this site having been built in the 1600s. 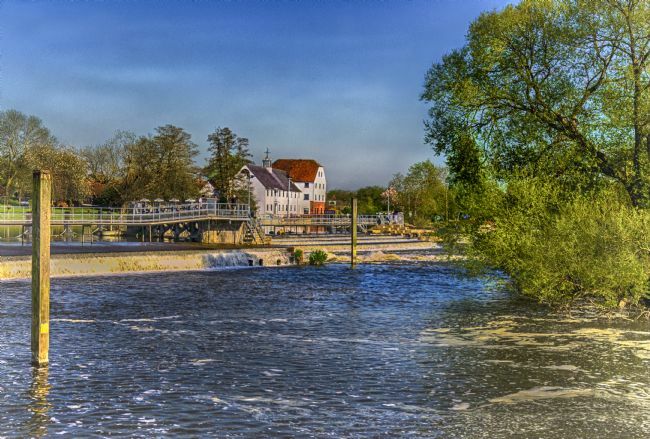 The earliest recorded mill here was in 1170. During th middle ages it was run by the local Augustinian priory but at the time of the Dissol;ution it pasdsed into the hands of Henry VIII. It operated until 1957 sfter which it became derelict. However, following subsequent restoration it was reopened in1973. The River Thames just above the old bridge at Abingdon in Oxfordshire, England. The bridge dates back to 1422 when the first construction was completed. In 1453 three new arches were built and then the whole thing was widened bit by bit in the C19th. It's really two bridges linked by Nags Head Island seen on the left - on which a public house stands. This image shows the older,northern section, the southern, named Burford Bridge, having a wider arch. Further upstream is the lock and weir. Standing under Reading Bridge which spans the River Thames, looking towards the northern, Caversham bank. This is a concrete single-span bridge connecting the town of Reading in Berkshire with Caversham. Originally there was just one bridge in the town - Caversham Bridge, - just further upstream. But as the main town absorbed the village of Caversham in the early 1900s, a new bridge was needed and this structure was finally opened in 1923. Just below the swing bridge carrying the road over the Kennet and Avon Canal at Sulhamstead, Berkshire. The surrounding buildings are reflected in the water and the whole scene is bathed in late afternoon sunlight. The Kennet and Avon Canal, 87 miles long, was constructed between 1794 and 1810 to link the Thames and Avon rivers, providing a smooth transport link between Bristol and London via Reading. The canal, once almost derelict, was restored in the late 1900s, being fully opened in 1990. An artist creating a watercolour of the scene through the canal bridge at Pewsey Wharf in Wiltshire. Here the Kennet and Avon Canal passes through on its journey between the Thames at Reading and the Bristol Channel. It incorporates parts of both the Rivers Kennet and Avon in parts known as 'navigations'. The canal was constructed between 1724 and 1810 and was a commercial waterway until the coming of the Great Western Railway. It was restored in the mid 1900s and was finally reopened in 1990. Looking across the River Usk as it flows through the market town of Brecon (Aberhonddu) in Powys, Wales, to the town's medieval castle. Beneath its walls the River Honddu discharges into the Usk - an ideal situation for a castle. This was one of the first stone castles in Wales, built by Bernard de Neufmarche in 1093. The Welsh, however, destroyed the town in the 1100s and so a stone shell keep and outer walls were built by the early 1200s. The section in the image dates from c.1300. The old abbey buildings at Abingdon, Oxfordshire. This view is of the Checker with its distinctive chimney. This building dates from about the 1260s and is the oldest surviving part of the abbey buildings. The abbey was first founded in the C7th but in the C9th was destroyed by the Danes. Rebuilt, it came to prominence in C10th and at the time of Henry VIII's Dissolution, the abbey was reckoned to be the sixth of the richest in England. This very elegant town hall sits in the centre of the town of Abingdon-on-Thames in Oxfordshire. The town was once in Berkshire and until 1867 was the County Town. The town hall, now a Grade 1 listed building was constructed between 1678 and 1682. It was designed to house the county courtroom above a sheltered market space. Both the master mason, Christopher Kempster and the clerk of works, John Scarborough were associates of Sir Christopher Wren whose influence can be seen. The scene from the Thames Path as it leads into Marlow on Thames in Buckinghamshire. Crossing the river behind the moored narrow boat is the iconic suspension bridge linking Buckinghamshire with Berkshire. Designed by William Tierney Clark it was opened in 1832 and is the prototype for the Szechenyl Chain Bridge over the River Danube in Budapest. To the left of the bridge is the landmark spire of All Saints Church which dates from 1835. The River Kennet, here part of the Kennet and Avon Canal, flowing eastwards through the centre of Newbury in Berkshire on its way to join the Thames at Reading. Here it has just passed through the Town Lock and is flowing under the Town, or Water Bridge as it is known. Newbury, now the administrative centre of West Berkshire, was, in medieval times, famous as a centre for making woollen cloth. The K&A canal seen here was finally opened between Reading and Bristol in 1810. A bench overlooking the old road bridge at Chepstow, Monmouthshire in Wales. 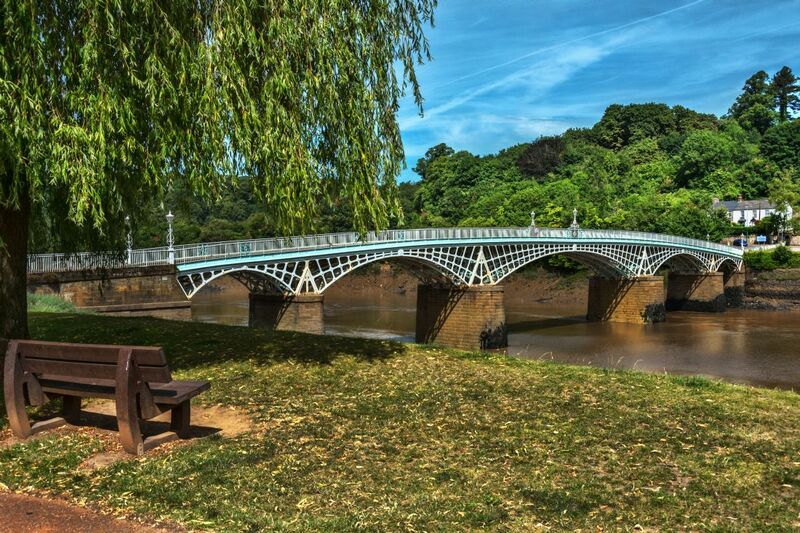 This graceful cast iron bridge crosses River Wye connecting Wales with Gloucestershire in England. Designed by John Rastrick of Bridgenorth, it is supported by enormous piers to withstand the force of the tidal flow. Here the water can rise and fall up to 14 metres - one of the highest ranges in the world! A view of Marlow on Thames in Buckinghamshire looking downstream towards the suspension bridge. This bridge, opened in 1832 and designed by by William Tierney Clark links Buckinghamshire with Berkshire on the south bank. It is also the model for the Szechenyl Chain Bridge over the River Danube in Budapest. To the left is the parish church of All Saints which dates from 1835 and replaced a 12th century building which had been demolished. This stretch of the Thames is famous for rowing. The footbridge over the River Pang at Tidmarsh in West Berkshire. Here the footpath follows the banks of the river to the Moor Copse Nature Reserve. Through the gate ahead, over a stile and across the bridge is the ancient parish church of St Laurence. Tidmarsh is a village by the River Pang, lying on the A340 between Pangbourne and Theale. 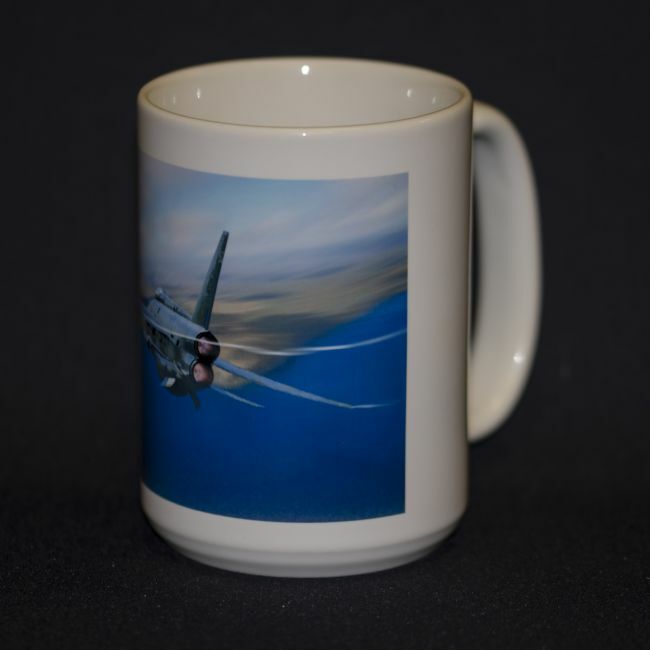 This image was captured early in December on a bright, frosty morning. This picturesque windmill stands on the hillside above the pretty village of Turville in the Buckinghamshire Chilterns. Sometimes known as Ibstone Mill or Turville Mill, it was built in the early 1800s to replace a much earlier one. It is of the design known as a 'smock mill' as the wooden weatherboarding looked like a farmworker's smock. This is a Grade 2 listed building. A blues/rock guitarist and singer entertaining the crowds at a motorcycle meet one warm evening during August. Standing on the Thames Path by Wallingford Bridge in Oxfordshire and looking over at the church of St Peter with its elegant open-work spire. The original church was destroyed by fire during the Civil War, the present one being built in the second half of the 18th century. It is no longer used as a regular place of worship. After heavy rain, the Thames rushing through Day's Weir near Little Wittenham, Oxfordshire. The Thames Path crosses the river over the lock and weir, carrying on upstream towards Abingdon. Apparently the name for Day's Lock and Weir comes from that of a local Catholic yeoman in the 17th century. The hurdy-gurdy or viella a roue (wheeled violin) is a stringed instrument where the strings are vibrated by means of a wheel coated in rosin which is turned using a handle. The melody strings are stopped by pressing keys which are attached to pegs whilst unstopped drone strings provide continuous single notes. It is often found in medieval art and these days is a popular folk instrument throughout Europe particularly France where it is sometimes played alongside bagpipes. The western entrance to the Ashford Tunnel on the Monmouthshire and Brecon Canal in Powys, South Wales. The tunnel is just east of Talybont, not far from the canal basin at Brecon. The only tunnel on the canal, it is 375 yards long and, as the image shows, is very low giving little headroom for boats passing through. Before the days of engines, boats would have to be 'legged' through whilst the horse was taken over the top. Originally the canal was constructed in the late 1700s to move coal, limestone and iron from the Welsh valleys to the coast at Newport. A scene just above Woolhampton in Berkshire on the the Kennet and Avon Canal. Narrow boats, several with log fires burning on board, moored above the lock. This was photographed on a sunny March afternoon. The Kennet and Avon or K&A was constructed in the first half of the 18th century to joinn London to Bristol. After falling into disuse from the end of the 19th century, it was restored in the late 1900s and is now busy with leisure boat traffic. Flanked by towers, the massive gateway leading in to Chepstow Castle. Standing above a crossing point on the River Wye, this is one of the oldest castles in Britain and it boasts the oldest doors in Europe! Building began in 1067 under William Fitz Osbern, forming the southernmost in a chain of castles guarding the Welsh Marches. It was later used in the conquest of Gwent in the 12th century. In the 1600s, it became a Royalist stronghold but after the Civil War it fell into disuse. This image was captured from the public footpath surrounding the castle. De Montfort Island, or Fry's Island as it is also known is a natural island in the River Thames at Reading, Berkshire. On it is a private house, a bowls club and a boatyard - all only reachable by boat! It lies between Caversham Bridge to the west and Reading Bridge to the east. Apparently in c1163 it was the site of a trial by combat between Robert de Montfort and Henry of Essex, King Henry II's standard bearer. Henry of Essex lost and was taken to Reading Abbey, later becoming a monk. A swan family on the grassy slope of the wharf near the town centre of Hungerford in Berkshire, England.This lovely market town, famous for its many antique shops has the Kennet and Avon Canal flowing through its centre. In the mid 1800s the wharf area would have been a hive of activity with boats loading and unloading at the industrial buildings here The canal, 87 miles long, was constructed in 1794 -1810 to link Bristol with the River Thames at Reading giving a direct link to London. The harbour at Maryport on the north coast of Cumbria. Maryport is the southernmost town on the Solway Firth and across the water can be seen the Scottish coast, This was once a thriving port centred round the coal and ship building industries. Having declined in importance since Victorian times, it is now developing as a holiday and cultural centre and the harbour is now home to fishing boats and yachts. The lighthouse stands just north of the Victorian seaside resort of Silloth on the north coast of Cumbria. It was established in 1864 as a warning for shipping on the Solway Firth. Originally mobile, it could be moved on a short rail track. However, in 1914 it was converted to the fixed position where it now stands. In a beautiful position, it looks over the Solway Firth to the coast, hills and mountains of Galloway in Scotland. This image was captured at sunset towards the end of June. The lovely old mill at Hambleden on the River Thames in Buckinghamshire, sitting just above the exceptionally long weir. Walkers can cross the weir on a footway which leads to Hambleden Lock on the Berkshire bank. From here the Thames Path leads upstream to Henley on Thames and downstream to Marlow. The mill itself has ancient origins and was apparently mentioned in the Domesday Book! More recently it has been converted into flats. A lane leading to the east coast on the island of Anglesey (Ynys Mon), North Wales. The sun is breaking through on a February afternoon giving a warm glow to the countryside and the old buildings on the hillside. Bridge 166 crossing the Monmouthshire and Brecon Canal as it leaves the basin in Brecon. Dating from the early 1800s the canal was constructed to transport coal and iron to Newport. It also joined with a system of tramways linking mines and quarries to the waterway. It winds its way through the Brecon Beacons, largely following the contours of the mountains as it tracks the course of the River Usk. It is currently navigable to Pontnewydd and plans are in place to extend this. The view from the shoreline at Crow Park on the edge of Keswick in Cumbria, looking south west towards Catbells and the western fells. Derwentwater is one of the main bodies of water within the Lake District National Park. It is approximately 3 miles long and 1 mile wide with a maximum depth of about 72 feet. The shore at Keswick is extremely popular with tourists who can hire rowing boats or take a less arduous trip on a launch. There are many walks around the lake and on the surrounding fells. A fishing boat from the Hastings fishing fleet being pushed into the water by a rusting tractor. When it returns it will be pulled up on to the beach by winch. Fishing boats have been beached on this area of shingle known as The Stade, an Anglo-Saxon word for landing place, for over a thousand years and this is now the largest beach launched fishing fleet in Britain. The parish church of St Matthew at Midgeham in West Berkshire viewed from the towpath of the Kennet and Avon Canal. There had been a chapel at Midgeham since the early 1300s but the parish church seen here was not built and consecrated until the late 1850s. Commisioned by the local squire, it was designed by John Johnson in the Early English style which was very popular in the Victorian period. It has a peal of six bells, the oldest having been cast in 1674. The meadows between Tidmarsh and Sulham in West Berkshire on an autumnal day. Tidmarsh is situated on the road between Pangbourne and Theale and parallel to this flows the River Pang, passing through the mill where the author Lytton Strachey once lived. This image shows the footpath to Sulham as it winds under the tree before crossing a small stream. The wooden footpath bridge taking the footpath linking the villages of Tidmarsh and Sulham in West Berkshire over the brook, sometimes called the Tid Brook, This view was captured one morning in late October. The valve tower next to the dam at the Pontsticill Reservoir in Powis, South Wales. Also known as the Taf Fechan Reservoir it is situated on the south side of the Brecon Beacons National Park and is within the Fforest Fawr Geopark. This gothic - styled valve house sits next to the dam and is adjacent to the bell-mouthed spillway. The lake is 2.5 miles long and covers 102 hectares - approximately 252 acres. A path leads round its shores and on the eastern side runs the Brecon Mountain Railway. A rowing boat waiting for hire on the Keswick shore of Derwentwater in Cumbria, England. Derwentwater is one of the main bodies of water within the Lake District National Park. It is approximately 3 miles long and 1 mile wide with a maximum depth of about 72 feet. The shore here at Keswick is extremely popular with tourists who can hire these rowing boats or take a less arduous trip on a launch. There are many walks around the lake and on the surrounding fells. Walking along the towpath and approaching the bridge over the Kennet and Avon Canal at Pewsey in Wiltshire, England. On a hot summer afternoon narrowboats are moored along the bank and an artist is painting a watercolour of the bridge. The Kennet and Avon Canal was constructed between 1794 and 1810, this section dating from 1810. The coming of the railway resulted in it falling into disuse until the mid 1900s when it was restored. It was fully opened again in 1990. Rising from the wooded hillside of the Taff Gorge above the village of Tongwynlais, are the fairytale towers of Castell Coch (Red Castle). Designed for the third Marquess of Bute by the eccentric Victorian architect William Burges in High Victorian Gothic style, the castle was only ever intended as a countryside retreat from the main residence in Cardiff Castle and was mainly used for entertaining. It was, however, built on the foundations of a medieval castle dating from 1267. One of the recently restored locks on the Crumlin arm of the Monmouthshire, Brecon and Abergavenny Canal. This is part of the Fourteen Locks flight taking the canal from Newport to Crumlin. Although disused at the present time, work has started on restoring the locks on this section with a view to opening the whole length to traffic once again. Pensarn Cottage near Newport on the Crumlin branch of the Monmouthshire, Brecon and Abergavenny Canal. This cottage is situated just below Lock 13 of the Fourteen Locks flight at the point where the towpath changes sides. This arm of the canal was opened in 1799, the flights of locks being a major feat of engineering. Here the canal is at present unrestored and is awash with wild flowers and grasses but work has started on making this a working waterway again. The lift bridge over the Monmouthshire and Brecon Canal at Talybont on Usk. On the navigable stretch of the waterway between Brecon and Pontnewydd, this bridge is electrically operated by boaters. Here the canal is on an embankment above the village street, The Monmouth and Brecon Canal dates from 1799 and was part of a system combined with tramways to transport coal and limestone to Newport. A corner of the village of Cookham which lies on the banks of the River Thames in the north east of Berkshire. Here stands Holy Trinity, the village's parish church with the entrance to the churchyard flanked by half timbered cottages. The church dates from the C12th with additions being added during the C13th. Sir Stanley Spencer, the renowned artist (1891-1959) who lived in the village, set many of his paintings in the locality, the churchyard being the setting of 'The Resurrection' (1924-7). A narrowboat heads upstream on the Kennet and Avon canal near Woolhampton in Berkshire, England. This image was captured on an autumn afternoon with the trees lining the banks turning to gold. The Kennet and Avon Canal, 87 miles long, was constructed between 1794 and 1810 to link the Kennet and Avon rivers and thus provide a smooth transport link between Bristol and London via Reading. It fell into disuse due to the Great Western Railway but was completely restored and reopened in 1990. A pretty thatched cottage in the village of Sulham, Bershire. The village lies at the foot of steeply wooded Sulham Hill and is situated just to the south of Pangbourne. 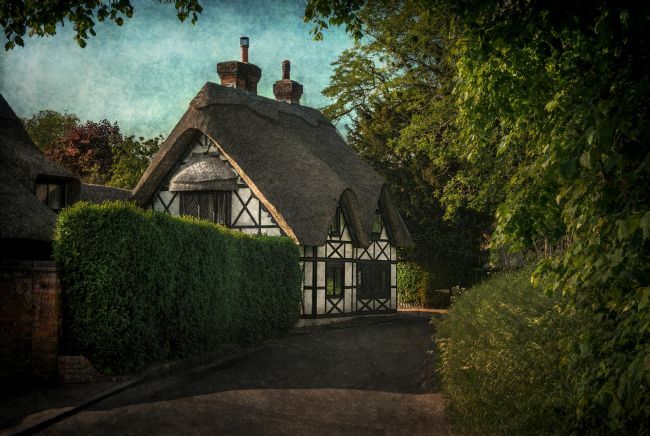 Several of the cottages here are in this somewhat whimsical 'ornamental cottage' style, having been built in the mid 1800s by the local landowners, the Wilder family, who lived in nearby Sulham House (Grade II listed). The bridge over the River Thames at Abingdon, Oxfordhire. This bridge carries the A415 into the town, travelling from Dorchester-on-Thames. The bridge dates back to 1422 when the first construction was completed. In 1453 three new arches were built and then the whole thing was widened bit by bit in the C19th. It's really two bridges linked by Nags Head Island on which the public house in the image stands. This shows the northern section, the southern, named Burford Bridge, having a wider arch. Seen from the Thames path between Marlow and Henley-on-Thames, the church of All Saints in the riverside village of Bisham in Berkshire, just upstream of the National Sports Centre. The Grade 2 listed church dates from the 12th century, the oldest remaining part being the tower. Part of the ruined buildings at Wallingford Castle in Oxfordshire. Hard to believe that this was once one of the most powerful castles in England - it was begun by Robert D'Oilly in 1067 on the orders of Wiliam I to control the Thames Valley. Over the years is was expanded and became a royal residence as well as fortress. During the Civil War of the 1100s, Matilda took refuge there. from King Stephen's armies. After the Civil War of the 1600s, it was 'slighted' or partially destroyed. The River Thames as it flows through the village of Cookham on its way to London and the sea. The Thames Path is a long-distance trail which follows the river all the way from Cricklade in the Cotswold Hills to the Thames Barrier in Greenwich, London. Cookham, on the banks of the Thames is a village lying in the furthest north-east corner of Berkshire, England. Here the artist Sir Stanley Spencer lived and set many of his paintings. This image captured on a late afternoon as shadows lengthened. Properly named the Sutton Bridge Extension, this picturesque bridge carries the road from Culham to Didcot over River Thames. It was built in 1809 as an extension to the longer Sutton Bridge and spanning the lock cut. This is a very narrow bridge, traffic flow being controlled by lights. The bridge crossing the River Thames at Clifton Hampden in Oxfordshire with the tollkeepers cottage on the far side. This narrow bridge with pedestrian refuges was designed by Sir George Gilbert Scott in 1867 to replace the ferry. It remained as a toll bridge until 1946. This view is from the Thames Path. The Weavers' Cottages stand on the towpath of the Kennet and Avon Canal in Newbury, Berkshire, just upstream from West Mills. Newbury was once famous for its cloth making with both the wool and finished product being transported along the canal by narrow boat. Looking over the moat to Caerphilly Castle (Castell Caerffili in Welsh) during a late September afternoon after heavy rain showers. Built in the late 13th century by Gilbert de Clare in order to secure this part of Wales from being taken over by the Welsh leader Llewellyn, building was begun in 1268 and it was immediately attacked! Building was then recommenced in 1271 and now It is the largest castle in ground area in Wales! Its surrounding moat and lakes are now a haven for wildlife. This image was taken from the public footpath surrounding the castle. The sun setting over the River Thames just upstream from Marlow in Buckinghamshire, looking towards Bisham on the Berkshire side. 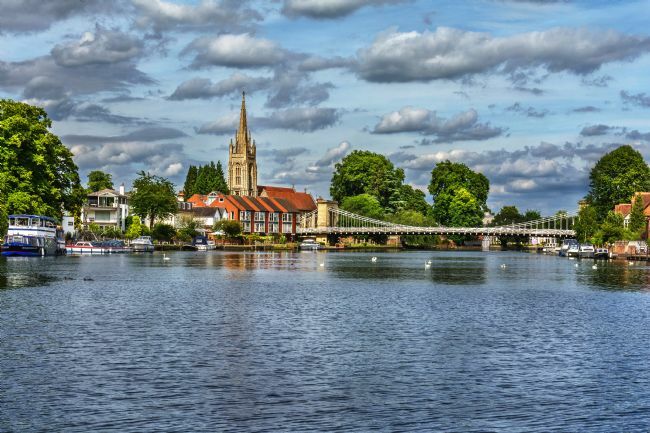 This stretch of river is frequently busy with rowing, kayaking and canoeing crews training as both Marlow Rowing Club and the National Sports Centre at Bisham Abbey are close by. However, on this peaceful late afternoon, apart from the walkers on the Thames Path, there are only two rowing crews remaining on the river! A view downriver at Marlow on Thames in Buckinghamshire captured on an autumn afternoon. The suspension bridge spanning the river was constructed in 1832 and was designed by William Tierney Clark' It was the prototype for the Szechenyi Bridge in Budapest and bears a plaque linking it with that city. The landmark church of All Saints was built in 1835, replacing a 12th century building demolished in 1802. The Kennet and Avon Canal at West Mills in Newbury with a narrow boat passing through the swing bridge. This image was captured on a June evening just before a rainstorm. Marlow, on the north bank of the River Thames in Buckinghamshire, captured from just above the lock and weir late one afternoon in Autumn. The river leads the eye towards All Saints church, the spire being a distinctive landmark in the area. Also in the background is the suspension bridge constructed in 1832. Designed by William Tierney Clark, it was the prototype for the Szechenyi Chain Bridge crossing the Danube in Budapest. A wooden fishing boat on the beach at Hastings Old Town on the south coast of East Sussex. Fishing boats have been beached on this area of shingle known as The Stade, an Anglo-Saxon word for landing place, for over a thousand years and this is now the largest beach launched fishing fleet in Britain. The beautiful sweep of sand and sea at Rhossili Bay on the coast of the Gower Peninsula, South Wales. This is the view from the cliff top leading to Worms Head which forms one side of the bay. Unsurprisingly this stretch of sand has been voted Britain's Best Beach for two years running - and the third best in Europe! It has featured in a number of film and TV programmes and featured in the opening ceremony of the 2012 Olympic Games. Looking across the moat at Caerphilly Castle and to its massive south facing walls and towers. This image was taken from the public footpath beside the moat. The castle was built in the late 13th century by Gilbert de Clare in order to secure this part of Wales from being taken over by the Welsh leader Llewellyn ap Gruffudd, Begun in 1268 - it was immediately attacked! Building was recommenced in 1271 and it is now the largest castle in ground area in Wales and the second largest castle in Britain! A picturesque cottage in the village of Turville, Buckinghamshire. The village is situated in the Chiltern Hills as they drop down into the Thames Valley. Nearby are the towns of Henley, Marlow and High Wycombe. Not surprisingly this pretty village has been the setting for many films and TV productions such as The Vicar Of Dibley and Midsomer Murders. This was photographed late one July afternoon. The image has added textures. 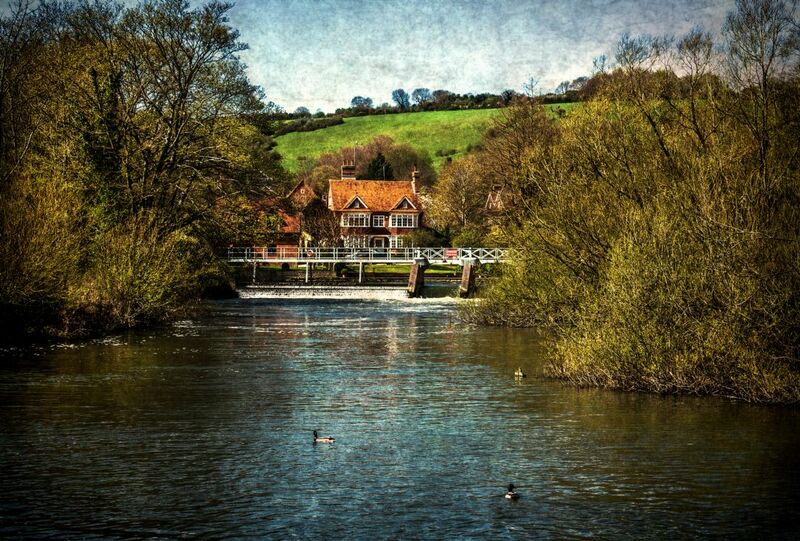 The water mill at Hambleden on the River Thames between Henley and Marlow in Buckinghamshire. This picturesque, Grade 2 listed old mill has a long history, having been mentioned in the Domesday Book when the the rental value was £1 per year! Its location is the appropriately named Mill End, where the fast flowing Hambleden Bourne discharges into the Thames. Immediately below it is the weir, one of the longest on the Thames. From here the Chiltern Hills gradually rise to the north. A narrow boat has just passed through Woolhampton lock on the Kennet and Avon Canal at Woolhampton in Berkshire, England. This lock was constructed between 1718 and 1723 under the supervision of the engineer John Hore of Newbury. It was part of the Kennet Navigation - that is part river and part canal. The Kennet and Avon canal was constructed to join Bristol and London via Reading making the transport of goods smoother. It closed due to the Great Western Railway but was reopened in 1990. The lane next to the watermill at Goring on Thames leading over the mill race which plunges under the mill, then on to pass under the road bridge to the lock. Turn left at the bridge to follow the Thames Path to Pangbourne. The mill features in a painting by JMW Turner. The Thames here passes through the Goring Gap between the Chiltern Hills and the North Wessex Downs. The church of St Andrew's in the village of Chaddleworth in the heart of West Berkshire. There was a church here in Saxon times and some stones from then can apparently be found at the base of the tower. However, the building as we see it is mainly Norman with 13th century additions. The south door is a superb example of decorated Norman work.The village of Chaddleworth lies on the southern slopes of the Berkshire downs on the A338 which runs between Hungerford and Wantage. Spring flowers are scattered through the fresh green grass in the churchyard at St Laurence church at Tidmarsh in Berkshire. This Grade 1 listed C12th church with its unusual wooden bell cote has a superbly decorated Norman doorway, a Norman font and C13th lancet windows. The box pews lead to an unusual polygonal apse. There are also traces of C13th wall paintings in two window recesses. Just beyond the church the River Pang flows on its way to join the Thames at Pangbourne. Late afternoon sunlight falling on the parish church of St Peter and St Paul in Checkendon, Oxfordshire. The church dates from the C12th and is a Grade 1 listed building. It was probably built by the Normans though aspects of the building styles suggests it might have Saxon origins. Inside there are medieval brasses and early C13th wall paintings. One relatively modern window was designed by Lawrence Whistler (1962). Checkendon village sits in the southern Chiltern Hills not far from the Thames. The parish church of St Mary in the Thames-side village of Streatley in Berkshire. It lies very near the river and is almost next to the bridge linking Streatley with Goring. The church dates from the 13th century but was largely rebuilt in the mid 1800s as it was becoming rather dilapidated. However, many of the original building materials were used such as stone and the flint used for facing. At this time the nave roof was heightened and the clerestory windows added to give more light. The church of St Nicholas in the village of Sulham in West Berkshire. It forms a third of the joint parish of Pangbourne, Tidmarsh and Sulham. The church is in the centre of the village standing next to Sulham House. Originally dating from the C13th , it was rebuilt between 1836 and 1838 by Rev John Wilder, vice provost of Eton College who lived in Sulham House. Originally the tower was topped by a tall spire but this was removed in 1959. In early spring the churchyard is awash with crocuses. The wharf at Hungerford on the Kennet and Avon Canal in Berkshire. This view is from the town bridge looking upstream to the lock. A pair of boats are about to moor at the wharf. During the mid 1800s, this was a thriving industrial area lined with buildings. Boats would have been busy loading and unloading goods such as Bath stone for building. The canal was constructed between 1794 and 1810 to link the Thames at Reading with Bristol, enabling goods to be transported from London to Bristol. A view form the bridge at Goring on Thames. The church of St Thomas of Canterbury, dating from the 1100s, lies behind the mill and the millpond which feeds back into the river. Goring, in South Oxfordshire is on the north bank of the Thames directly opposite the smaller village of Streatley on Thames in Berkshire on the south bank. Here the river flows through an opening between the Chiltern Hills in the north and the North Wessex Downs in the south, known as the Goring Gap. A dinghy moored on the Oxford Canal at Thrupp near Kidlington, Oxfordshire. 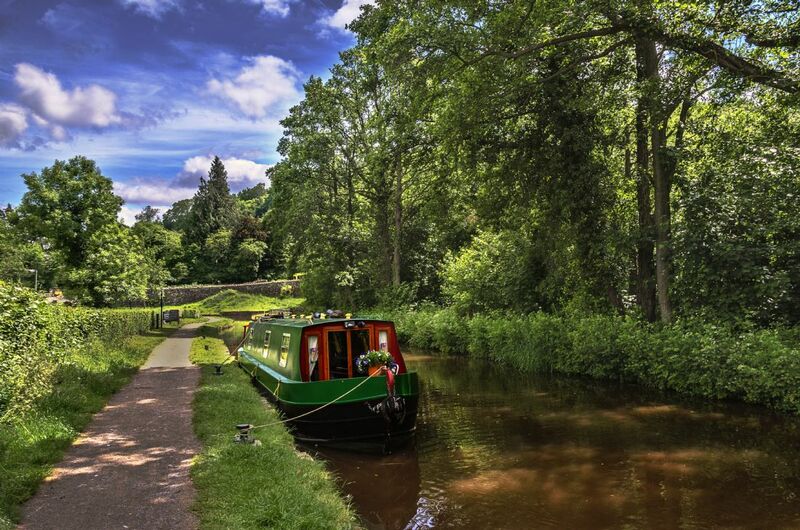 The Oxford Canal, 77 miles long, was constructed in the late 1700s and was opened in stages between 1774 and 1790. The aim was to connect Coventry and its nearby coalfields with Oxford, the Thames and eventually London. It's a contour canal meaning it follows the line of the hills rather than using flights of locks to climb them, resulting in fewer locks overall. The lift bridge (221) at Thrupp on the Oxford Canal just north of Kidlington in Oxfordshire. Thrupp is a purely canal village - the road stops here! Aubreys Bridge or, as it is sometimes known, Smithy Bridge takes traffic to a car park and tea rooms. Boats passing through the bridge take a sharp left turn to moor or continue on the way to Banbury. This part of the Oxford Canal opened in 1788 and largely follows the course of the River Cherwell. It winds round hills, so locks are well spaced. A canalside scene at Shipton-on-Cherwell in Oxfordshire. The Oxford canal here is overlooked by the parish church of Holy Cross. The church and village predate the canal by several centuries - the River Cherwell being the only waterway then! There has been a church here since the C12th but after a number of additions it was demolished in 1831 and the present Gothic Revival one built. The canal arrived in 1788, built to link the Midland canals with the Thames at Oxford and thence to London. Caversham bridge, built in 1926, spanning the River Thames at Reading, Berkshire. It connects Reading with Caversham on the river's north bank. There has been a bridge here since the 1100s and in 1231 it is mentioned by Henry III who notes the presence of a chapel on the bridge on the side owned by William Marshall, Earl of Pembroke. There was a skirmish here during the Civil War when the Reading side had a wooden drawbridge which was later painted by JMW Turner. Looking westwards from beneath the canal bridge over the Kennet and Avon at Pewsey in Wiltshire. An artist has set up his easel and is capturing the scene in watercolours. Along the north bank narrowboats are moored whilst the towpath winds alongside the canal's southern side. This K & A canal was constructed between 1794 and 1810, this section being completed in 1810. This meant that goods could be smoothly transported to and from Bristol via Reading to London, the midlands and the north. 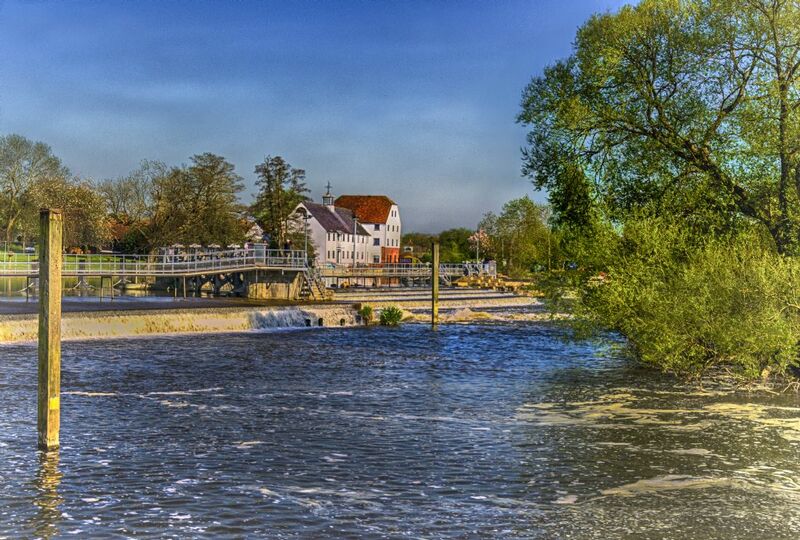 Looking upstream from the road bridge, the weir at Goring on Thames in Oxfordshire. On the island to the right stands the white painted lock keeper's cottage, conveniently situated between the lock and weir. Here the Thames flows between the North Wessex or Berkshire Downs to the south and the Chiltern Hills to the north. This feature is known as the Goring Gap. Not surprisingly this stretch of the river is popular with both painting and photographic artists. The River Thames as it flows between the villages of Streatley to the south and Goring to the north. This is a break between the North Wessex (Berkshire) Downs and the Chiltern Hills known as the Goring Gap. This is the view looking west from the bridge. Moored on the left is one of the old Oxford College barges - now an events venue for the hotel on the river bank. To the right the Thames rushes over the weir, boats passing through the lock. This is a popular scene with artists. Two narrow boats on the Kennet and Avon Canal moored just downstream from Woolhampton in West Berkshire. The image was captured in early March on a bright and calm late winter afternoon. The Kennet and Avon Canal, 87 miles long, was constructed between 1794 and 1810 to link the Kennet and Avon rivers and thus provide a smooth transport link between Bristol and London via Reading. It fell into disuse due to the Great Western Railway but was completely restored and reopened in 1990. 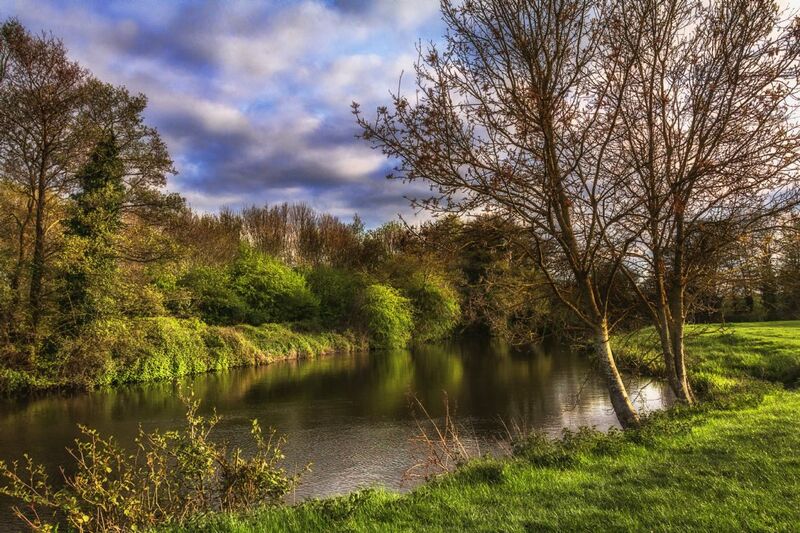 A stretch of the River Kennet at Burghfield in Berkshire,as it winds its way towards Reading. This is a navigable stretch of the river which forms part of the Kennet and Avon Canal. Here it is quiet after flowing under the roaring traffic of the M4. A little further on it passes Burghfield Mill, a large Georgian building now converted to flats. The Kennet and Avon was constructed in the early 1800s to connect Bristol with London via Reading, mainly to carry Bath stone for buildings. Cottages in the churchyard at Turville in Buckinghamshire. This picturesque village lies in the Chiltern Hills as they roll down into the Thames Valley. Not surprisingly it has been the location for many films and TV productions such as The Vicar of Dibley and Midsomer Murders! Photographed late in the afternoon during July. The image has added textures. The Thames between Folly Bridge in Oxford and Iffley . A rowing boat is emerging from under the bridge which joins Boathouse Walk and Christ Church Meadow Walk. Next to this are some of the Oxford College boathouses on a stretch of the river famed for boat racing. Pleasure boats and punts are often to be seen here as well as rowing crews in training. The lock keeper's house on an island next to the lock at Goring on Thames, Oxfordshire. This is the view from the southerly river bank at Streatley on Thames in Berkshire. Linking these two villages is a fine iron bridge built in 1923 which can be seen in the background. Here the Thames flows through a gap in the hills - the Chilterns to the north and the North Wessex Downs to the south, This is thought to be one of the most beautiful; stretches of the river. The toll bridge at Whitchurch on Thames, spanning the river between Pangbourne in Berkshire and Whitchurch in Oxfordshire. There has been a bridge here since 1792, the present iron one, constructed in 1902 being the third. It is one of the few remaining toll bridges on the River Thames. From October 2013 until September 2014 the bridge was closed to traffic in order that it could be completely dismantled and refurbished. The parish church of St Michael and All Angels at Blewbury, Oxfordshire. Blewbury is a picturesque village in the North Wessex Downs not far from Didcot. At its centre is the parish church surrounded by old brick built cottages and almshouses. The church dates from the 11th century with additions constructed later in medieval times. It is surrounded by its churchyard which is designated as a living churchyard containing a variety of flora and fauna. The towpath by the Kennet and Avon Canal leading eastwards into the town of Hungerford in West Berkshire. During the mid 1800s, this was a thriving industrial area lined with canalside industrial buildings. Boats would have been busy loading and unloading goods such as Bath stone for building the new mansions in London. The canal was constructed between 1794 and 1810 to link the Thames at Reading with Bristol, enabling goods to be transported smoothly from London to Bristol. The Kennet and Avon Canal as it passes through the village of Pewsey in Wiltshire. This is the scene just above the bridge at Pewsey Wharf with narrow boats moored on the northern bank. This section of the canal was opened in 1810. The Kennet and Avon was designed to join Reading with Bristol and was constructed between 1794 and 1810. The coming of the Great Western Railway however spelt the end of the canal and it gradually fell into disuse.After restoration it was fully opened again in 1990. The view from under the bridge over the Kennet and Avon Canal at Pewsey Wharf in Wiltshire. On a hot summer's day, narrow boats are moored along the canal side and the water reflects on the warm red bricks of the bridge. The canal reached here in 1810 when the wharf would have been a hive of industrial activity. The construction of the Great Western Railway which arrived at Pewsey in 1862 resulted in the canal falling into disuse. Following restoration, however, it fully reopened in 1990. A cottage down a country lane in the village of Sulham, Berkshire. The village lies at the foot of a steep and wooded hill just to the south of Pangbourne. Several of the cottages in Sulham are in this rather whimsical 'ornamental cottage' style, having been built in the mid 1800s by the local landowners, the Wilder family, who lived in nearby Sulham House. A lived-in narrowboat moored on the Kennet and Avon Canal at Hungerford in Berkshire, England. This image was captured on a sunny autumn afternoon with the still water reflecting the trees. The Kennet and Avon Canal, 87 miles long, was constructed between 1794 and 1810 to link the Kennet and Avon rivers and thus provide a smooth transport link between Bristol and London via Reading. It fell into disuse due to the Great Western Railway but was completely restored and reopened in 1990. The view from the north bank of the River Thames at Goring in Oxfordshire,looking across to Streatley village and Streatley Hill, or Lardon Chase in Berkshire. Here the Thames flows between the North Wessex or Berkshire Downs to the south and the Chiltern Hills to the north, this feature being known as the Goring Gap. The weirs here once provided the power for water mills and now control the flow of the river. Only one working mill survives, further downstream at Mapedurham. The new foot and cycle bridge over the River Thames at Reading, Berkshire just upstream from the busy road crossing at Reading Bridge. The footbridge, named Christchurch Bridge as the result of a poll, links Caversham to the north with Reading and in particular the station on the south bank. 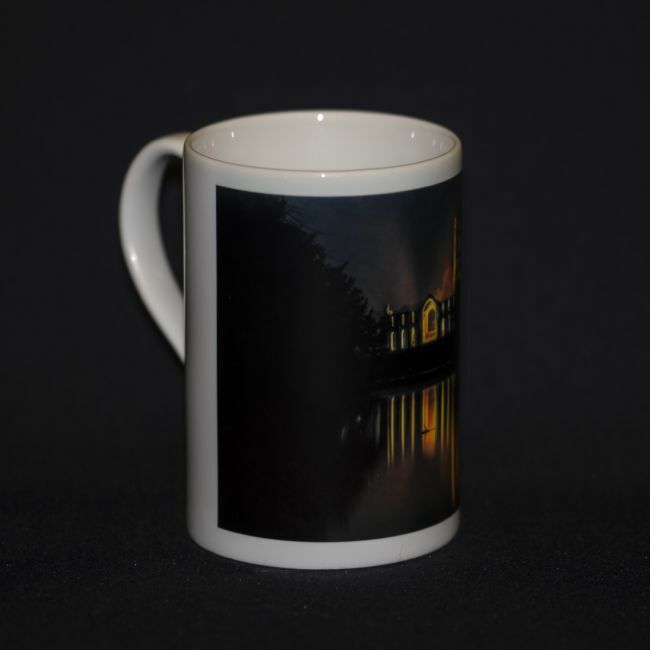 The name reflects historic links with Christchurch Cathedral in Oxford. The bridge was opened in 2017 by the Mayor of Reading with an inaugural game of poohsticks! A group of thatched cottages clustered round the church in Sulhamstead Abbots, West Berkshire. This quiet village is just to the south of the busy A4 or Bath Road which here runs between Reading and Newbury. St Mary's church, which has a distinctive white weatherboarded belfry, is largely C12th and is a grade 1 listed building. The village and the church are on the edge of high ground surrounded by farmland and overlook the Kennet valley.